The N610C is Sony's latest addition to its high-end N series. It has all the functions of the rest of the N series except audio playback. This handheld has two possible casings: satin silver and metallic purple. The silver one makes the N610C almost indistinguishable from the N710C. The purple one looks more like violet to me. I'm not sure why Sony decided to make a violet handheld; maybe they thought it would appeal more to women. As for its appearance, I think everyone should judge for themselves. I'm no art critic. Look at the pictures and make up your own mind. Below the screen on the front of the N610C are the hardware buttons with a single rocker switch for up and down. These are a bit harder to push than I'm used to, which makes fast games that involve a lot of button pushing more difficult than they ought to be. On the left side is the Jog Dial and the Back button. As the N610C doesn't have built-in audio playback, the headphone port that is on the N710C is missing from this model. 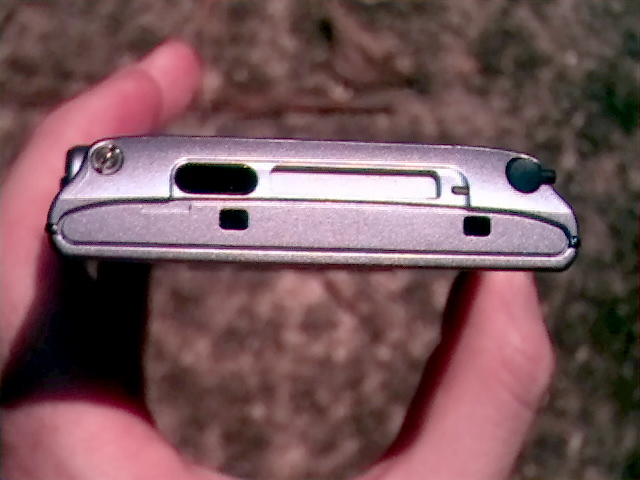 On the top is the infrared port, the Memory Stick slot, and the slots to hold the flip cover on. The right side is pretty much taken up with the stylus holder. Like all Sony models, all except the very top of the stylus is held inside the casing. On the bottom of the N610C is the serial port with some slots to allow clip-on peripherals to attach. There is another slot on the back. This is the standard configuration for the whole N series. Also on the back is the only place on the handheld that it says it is a PEG-N610C, along with the rest of the fine print. The casing itself is thicker than its main competition, the Palm m505, which to me means the m505 fits better in my pocket. The N610C is less wide than the m505, though a bit taller. I think the N610C fits better in the hand, mostly because the sides are easier to grip and lack the m505's open channel slots. There is little doubt that the crowning glory of the N610C is the screen. It is a reflective TFT LCD with 320 by 320 pixel resolution and can display over 65 thousand colors. It has 16-bit color because it comes with Palm OS 4.0, which has support for that many colors. Until OS 4, the only PalmOS handheld with a 16-bit screen was the Visor Prism, and that only because Handspring wrote a special version of OS 3.5 to support it. That leads to the odd situation where this Sony device has a 16-bit screen because it is using code Handspring wrote and gave to Palm who then licensed it to Sony. The USB support in OS 4 was also written by Handspring. The N610C's screen is just awesome. It is easily the best screen available in a Palm OS device and possibly better than that on any other handheld. When the first Sony devices came out with 320 by 320 resolution, I'll admit I wasn't tremendously impressed mainly because there weren't very many applications available that made good use of the high-res screen. Months later, some are starting to appear that make it clear that the days of 160 by 160 resolution are numbered, at least on high-end devices. I suggest you take a look at Crs-Launcher, a freeware app that takes the place of the default Launcher. It makes good use of the N601C's hi-res screen. Another good hi-res app is one that will be announced later this week that I'm not allowed to talk about other than to say it that it makes great use of all the additional screen real estate, if you are willing to live with a really small font. One example of a new game that makes good use of the N610C's screen is Atom Smash 2.0. I'm sure many more are in development now. The best advice I can give you for finding third-party apps for the hi-res screen is to join a user group like this one on Yahoo! Groups. The N610C comes with PictureGear Pocket but not with it preinstalled. It must be loaded from the CD. I think this is odd because gMovie is preinstalled. As listening to the audio with gMovie requires buying the Audio Adapter, I think PG Pocket is much more likely to be used. They have updated PG Pocket and it supports the full resolution and colors of the N610C's screen and they have improved its usability a bit. The demo pictures that come with the app really show off the N610C's screen's amazing ability. The N610C also comes with a companion application: Photo Stand. This lets pictures in PG Pocket format be displayed as a slide show. It is intended to allow people to use their handheld in its cradle as an always-changing picture on their desk. You can select a set of pictures to cycle through and even display a digital or analog clock. I'm not fond of the plastic coating Sony puts on its screens. It just doesn't make a very good writing surface. Fortunately, the solution for this is simple: get some kind of screen protector. I use the simplest one of all, a piece of scotch tape over the Graffiti area. As on the N710C, Sony has included something it calls High Resolution Assist. This replaces the default font in all applications with a hi-res one. This lets just about any app you load take advantage of the hi-res screen. Its possible that this might cause a problem with some third-party applications so you can turn it off for each individual app or just disable it completely. I've only ever found one app that had had a conflict with Hi-Res Assist, a game. I think Hi-Res assist is great but not perfect. Maybe it's only me but I just don't like the font that Sony chose. I really hope that future versions will give the user a choice of fonts. I'm always happy to review a Sony model because it gives me another chance to talk about how great I think jog wheels are. Between ebooks and AvantGo, I read a lot of text on my handheld and being able to move up and down with just a flick of my thumb is really convenient. Below the Jog Dial is the Back button, which does just what its name suggests. For example, if you are in an application, you can push the Back button to go back out to the app launcher. If you enable JogAssist in the Preferences app, holding down the Back button will open the drop down menu, as if you had tapped the Menu button. Another option is to set the Back button to work as an Off switch. By default, it already works as an On switch. Used together, the Jog Dial and the back button let you perform a lot of tasks one handed. For example, I'm in the middle of reading an ebook now with WordSmith that has each chapter as a separate file. When I finish a chapter, I hold down the Back button, which brings up the drop down menu. I use the Jog Dial to move down on the menu to Close, and push down again to select it. That puts me back out to the list of Doc files so I again use the Jog Dial to move to the next one I want to open. Pushing down one last time on the Jog Dial opens it and I can go on. I never even had to consider pulling out the stylus. Of course, the N601C comes with a Memory Stick slot. However, it doesn't come with a Memory Stick. I wish it did but of all the PalmOS models, only the very high end N710C and its replacement the N760C come with one. I think all the high end models should. The expansion slot is one of the main features of these models and to have them not come with a memory card is almost as bad as if they didn't come with a stylus. I'll cut the mid-range models some slack but the high-end ones, including the m505, should have a SD or Memory Stick in the box. The N610C does come preinstalled with MS Gate, the application needed to move files between internal memory and a Memory Stick. This application is decent, though it doesn't compare to the excellent third-party app McFile. It also comes with a pair of applications that make this handheld significantly easier to use than the competition. Memory Stick Import is an app that runs on the N610C while Memory Stick Export is a Windows app. Together, they allow a Memory Stick inserted in a N610C in its cradle to appear on as a removable drive on the PC. With this you can use your Clie as a removable hard drive. Say you have a file you are working on at your office. You can copy it onto the Memory Stick and take it home. Assuming you have a cradle at home, too, you can copy it back off the handheld and continue working. Not surprising for a high-end handheld like this one, the N610C uses the fastest processor available for a PalmOS device, the 33 MHz Motorola Dragonball VZ. It has 8 MB of memory with 7.2 MB actually accessible. It also has 4 MB of Flash ROM, meaning its OS is upgradable. This is less of an issue that it is with the N710C because it comes pre-installed with OS 4.0. The N610C's screen is powered by MediaQ's MQ-1100 Platform Controller Chip, which integrates a 64-bit 2D graphics engine, direct LCD display interface, and a USB device controller. It includes 256 KB of embedded SRAM. This chip gives the N610C's hi-res hi-color screen great performance when using demanding applications like games. 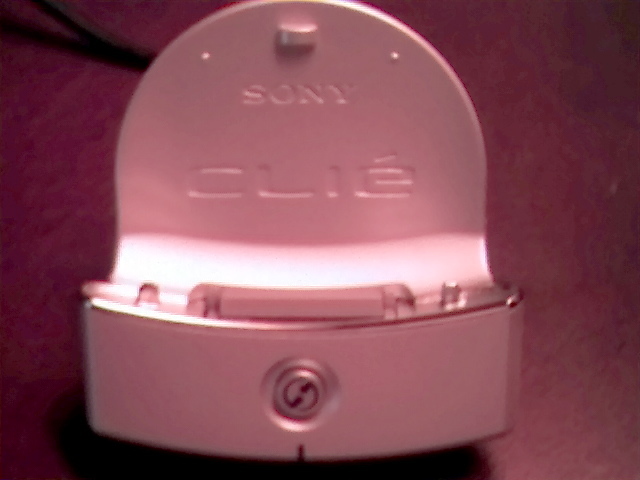 The flip cover is a light silver color, though I have the purple version of the N610C. I suspect that both colors of this handheld got the same flip cover. It is made out of some leatherette-type material that looks good but shows stains easily. The flip cover attaches at the top and can flip around all the way to the back. It has been shaped at the bottom so the buttons are covered and the cover itself won't push them. However, I think the flip cover is poorly attached to the handheld. It's held on with two very small plastic clips that don't look like they'll go the distance. I can easily see them breaking off or just wearing out fairly quickly. This cover provides some minimal protection for the screen but don't think for a second that it can take the place of a hard case if you are looking for real protection. The stylus is the same one that comes with all the Clié models. It has plastic tip and top and a metal shaft. Of course, there's a Reset pin under the top. Really, there's not much to say about it because it just does what it is supposed to do without any flaws. It gets its power from an adapter that plugs into the cradle. I think this is the best power cable available because it can also be used as a travel charger. It can be plugged into either the cradle or directly into the N610C's serial port. The prongs on the wall plug even fold down to save space. 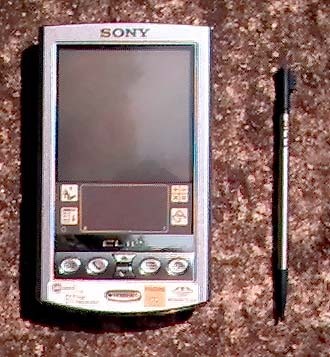 While the earlier models of Sony handhelds required third-party software to HotSync with an Apple Macintosh, this isn't true of the N610C (or the S320). As long as you are using the very latest version of the Palm Desktop, you can sync right out of the box. However, you can't mount the Memory Stick on your desktop as a removable drive. To do that, you need to buy Mark/Space's The Missing Sync for $30. The N610C's screen sets a new standard for PalmOS handhelds that will be tough to beat. If the screen is your primary factor when deciding what handheld to get, the N610C is the way to go for you. I'd agree with the full review except for the comment that a memory stick should be included. I'd rather they reduce the price by $20 so I can buy my own memory stick in the size I choose. I have a 710c and bought a 128 card, so I'm stuck with a measly 8mg stick still sitting in the box. One comment that I really agree with is that the buttons are too small (I'd say way to small) Sony really dropped the ball on this and I haven't seen anyone mention of it. If you play games that use the buttons it makes it much more difficult. In contrast, the Prism buttons are excellent, they're a nice size and they have a great resistance to them. All in all, I love my 710C and I'm psyched for the 4.1 release. I like the blue/violet color and bought one. But then I'm not afraid of being seen as a "women" like the reviewer. I guess I'm just more secure that way. Also the buttons and the scroll buttons need improvmenet. You didn't say anything about that. You get a Not Satisfactory in Reading and Comprehending class for today. Check out the fourth paragraph. He briefly mentioned the rocker switch and nothing aobut the buttons. Reread it yourself moron. Look at the "Cons" sidebar. He mentions the buttons are hard to press. Also, the 610 case is nearly identical to the 710. It stands to reason that any shortcomings of the 710 would also be in the 610. In reality, I think the buttons are "okay". Not the greatest, but certainly usable. They do take some getting used to though, and I suspect someone with larger fingers may have a more difficult time adjusting to them. this device, as well as Sony's other new Clies, are for doing anything but the very basic functions. It seems odd that Sony would have dropped the ball on these as the rest of the unit is outstanding. I also hope other manufacturer's begin supporting the Clie series with some descent add-on peripherals. And yes I know Targus already has the great stow-a-way keyboard available and mine is on order. Out of my 17 different Palm OS PDAs, this one is just about to become my favorite. 17 palm pda's? man you're ill! 17 Palm OS pda's??? Wow..
Gee, have there actually been 17 different models, or do you have duplicates? Well, that's 18 right there, and I haven't even counted Sony, Handspring, or Handera. Gosh, these things pile up, don't they? P.S. I have to agree on the Clie button issue, in particular the rocker button. It is not at all easy to use and downright frustrating. I have no problem with the buttons. The Clie 610 is the perfect size. If they increased the size of the unit to accommodate larger buttons, that would be bad. I agree that the rocker is difficult to use, but I rarely use the rocker. The jog dial and the stylus do everything I need them to do. There really is an urgent need for SONY to develop its I/O peripherals. Otherwise this brilliant screen is in danger of being an idiot savant. I want to wirelessly check and respond emails and go online and communicate with the rest of the world. Ditto, Ditto, Ditto, - When is Sony going to step it up with a wireless add-on or an all in one??? Soon, please I'm in desperate need of replacing my Vx & Omnisky. I agree with this, I still have a Palm Vx with the OmniSky modem, and don't plan on upgrading to any PDA until I see a really nice wireless solution. The Pocket PC 2002 devices look tempting as well, but even then I'm not going to buy one unless they come with an elegant solution for wireless access. The iPaq solution didn't interest me (where you had to keep the sleeve on it and then have that Sierra AirCard thing or whatever it was). Whatever next generation device I buy will most likely be based on which has the best wireless internet options. Great device at a great price!!! I think this pda is the best Palm OS device out there. If you do your research you can find a 610 for under the $399.00 price tag (I got mine from dell for $330.00). Also yea would of like to see a 8mb memory stick included but considering the price I paid I'm not complaing. You can pick an 8mb MS on ebay for under $15.00. Also I do not think the violet color is feminine at all! I travel at least once a month on business and I have recieved many compliments on the color from both men and women. I think its a pretty funky color and believe more pda makers should release more than just silver, grey or black colors. RE: Great device at a great price!!! I got my 610c/v for $299, but I won't tell you how. >I got my 610c/v for $299, but I won't tell you how. Hmmm....how 'bout a reward for this moron. "Most useless post of the millenium" perhaps? Hey friend I got mine for $400.00, so what.??? And if I lost it I would buy another one in no time. Looks to me you can't afford $400.00......Perhaps there's a lot of people that can't afford it too....Maybe you should use this way of communicating to let people benefit just as all of us do......I'm sure you benefit as well from this site.......Don't be a fool? And hey, I have a dozen Rolex watches to sell the first replier. What a dope! Its probably the same person who shaved his head to look like Michael Jordan. I have some authentic Michael Jordan earings to sell you too - at really good prices. $299 ay? Sure, and I have a one-way ticket in your name for a non-stop flight from Boston to L.A. ITS FREE! Just for you. "Another good hi-res app is one that will be announced later this week that I'm not allowed to talk about other than to say it that it makes great use of all the additional screen real estate, if you are willing to live with a really small font." Hmmmmmmmmmm...Will you please post a story on this app when released? BTW, I have a 610 (used to use a IIIx) and love it. I would be interested in know what this is also!! Have'nt read the review yet, but thanks for posting it. I placed my order for the N610c last night, should get here by Sat. Hold the stylus up to your nose and take a big whiff. Can you honestly say it doesn't smell like utter sh*t? I thought my own was defective but I bought a 3-stylus replacement pack and all of them started smelling too. When my friends ask to see my new clie the 1st thing they notice after the nice screen is the smell from the stylus. Yes, it smells like a Sh*t !! I just smelled mine from my new 610 and it smells like metal. Maybe yours just needs to be washed or something. Who SMELLS a stylus? and WHY?? Can't you just see thousands of people from all over the country yanking out there stylus and giving it a good whiff? People are standing around the water cooler, passing a stylus to one another... "Hey Brenda... Smell this? What do you think it smells like?" I played around with the 610C and 710C at Circuit City for quite awhile and I DEFINITELY noticed that the 610C was more responsive than the 710C. Benchmark 2.0 showed a stock 710C running at 212 and the 610C running at 214. I beamed Benchmark on a 505 and it said that it was slower than a Visor Platinum (don't remember the number). I'm not sure that it's actually faster, it's the same processor but I think what I was seeing was that OS 4.0 is more responsive. Try clicking the application buttons on a 710 and 610 side by side. You'll also see the same thing on the m50x series. The only Sony machine available over here in the Netherlands is the PEG S300. Perhaps some of you remember that thing from long ago. The only high end pda's available here are the m-series from Palm. I cannot find a HandEra. Handspring has just released two models, one of which is identical to an existing one. This new Sony would easily sweep away all the competition over here because there isn't any. The only alternative is an iPaq. A lot of them around here. Sony, are you guys reading this? incorrect on one point i noticed. the review stated only high end clie's had included memory sticks.